Home>Music> Suge Knight's Son Says 2pac Is Back In The Studio: "This Ain't A Joke"
After claiming that Tupac Shakur was alive and well back in October, Suge J Knight, the son of the infamous Suge Knight, has returned with another sensational declaration. According to one of his uploads to social media, the legendary rapper is back on the studio grind and set to offer fans some new tunes in the near future. The text post reads, “I GOT PAC BACK IN THE STUDIO. NEW MUSIC COMING.” His caption drives his point: "This ain’t a joke. #NewDeathRow ? ?/>> Coming soon"
A likely theory would include a collection of unreleased recordings of the West Coast rapper being used to create new material. This would entail the involvement of Shakur's estate, who have not come forward with any information that would corroborate this project. There have been reports of plans to release two posthumous albums. Knight has not been named as a contributor to this process. Considering Junior's previous claims, however, the idea of Shakur actually hitting the booth would fit his narrative more appropriately. Despite the unlikelihood of this concept, some fans are asking for evidence of these miraculous sessions. Of course, many other social media users are calling the ordeal an upsetting lie. Insults were also thrown, labeling Knight as a clout-chaser. 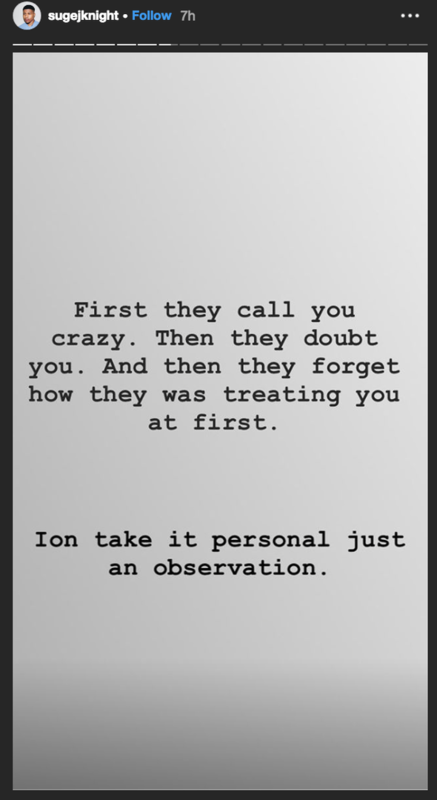 The naysayers seem to be addressed in Knight's Instagram stories. "First they call you crazy. They doubt you. And then they forget how they was treating you at first," he wrote. " Ion take it personal just an observation." MUSIC Suge Knight's Son Says 2pac Is Back In The Studio: "This Ain't A Joke"